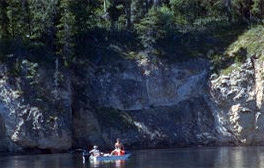 On Babine Lake near the community of Granisle, this popular park is named for the ironstained cliffs that plunge almost perpendicularly into the lake. Park visitors can swim, sunbathe, angle for a rainbow trout or take in the salmon enhancement projects at nearby Fulton River and Pinkut Creek. Boaters like to explore the extensive shoreline of Babine Lake, the longest natural fresh water lake in British Columbia. At the Village of Topley on Hwy 16, go north for 45 km on Hwy 118. Wildlife: Scenic walking trails provide excellent lake views and the opportunity to observe wildlife. Black bear and moose are especially abundant. Varied waterfowl, including Sora Rail, inhabit the lake and marshes. The salmonoid enhancement project at the nearby Fulton River Hatchery is also well worth visiting. Babine Lake is an angler’s paradise. Cutthroat, rainbow trout and char are found in the lake. Flyfishing and trolling yield superb results. The approved Red Bluff Provincial Park Management Direction Statement [PDF] is available in pdf format. Babine Lake is an angler’s paradise. Cutthroat, rainbow trout and char are found in the lake. Flyfishing and trolling yield superb results. Anyone fishing or angling in British Columbia must have an appropriate licence. The Bluff Trail is available to park visitors. It is a self-guided interpretive trail and makes an easy 3km loop. The trail may be flooded at different times of year due to water fluctuations on Babine Lake. For your own safety and the preservation of the park, obey posted signs and keep to designated trails. Shortcutting trails destroys plant life and soil structure. There are wildlife viewing opportunities at the viewing platforms along the Bluff Trail. A variety of waterfowl and song birds frequent the marsh areas and can be seen at any time of the day. There is a moderate-grade boat launch at this park. A breakwater wharf and dock are also available. Firewood can be purchased from the park operator in some parks or you can bring your own wood. Fees for firewood are set locally and may vary. To preserve vegetation and ground cover, please don’t gather firewood from the area around your campsite or elsewhere in the park. Dead wood is an important habitat element for many plants and animals and it adds organic matter to the soil. You can conserve firewood and air quality by keeping your campfire small. Limited burning hours or campfire bans may be implemented and some parks may use communal fire rings. Be prepared to bring a portable stove for cooking. There is one cold-water hand pump. The day-use area has several picnic tables and is located on a grassy area beside the beach. Campfires are permitted but visitors must supply their own firewood. Campsite reservations are accepted and first-come, first-served sites are also available at this park. There are 27 standard sites available. Five are beachfront and the rest are shaded. There is a large parking lot available for extra vehicles to park. There is a gate at the entrance of the park it is locked from 11:00pm to 7:00am. When the gate is locked visitors are not permitted to walk in and camp. The gate is locked 24 hours a day in the off-season.